In the rigid theocracy of Salem, Massachusetts, rumors that women are practicing witchcraft galvanize the town. 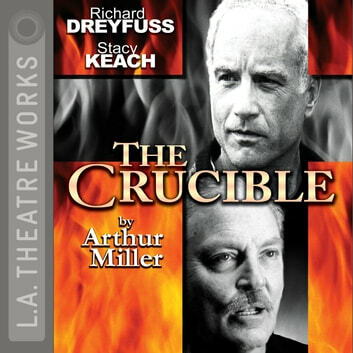 In a searing portrait of a community engulfed by panic―with ruthless prosecutors, and neighbors eager to testify against neighbor―The Crucible famously mirrors the anti-Communist hysteria that held the United States in its grip in the 1950s. Arthur Miller's Tony Award Winner for Best Play. A BBC and KCRW co-production. An L.A. Theatre Works full cast performance featuring:Richard Dreyfuss as Reverend John HaleStacy Keach as John ProctorEd Begley Jr. as Thomas PutnamMichael York as Reverend ParrisHector Elizondo as Giles CoreyIrene Arranga as Mercy LewisRené Auberjonois as Deputy Governor DanforthGeorgia Brown as Rebecca NurseJack Coleman as Marshal HerrickBud Cort as Ezekiel CheeverJudyann Elder as TitubaFionnula Flanagan as Elizabeth ProctorAnn Hearn as Susanna WalcottCarol Kane as Mary WarrenAnna Sophie Loewenberg as Betty ParrisMarian Mercer as Mrs. Ann PutnamFranklyn Seales as Judge HathorneMadolyn Smith as Abigail WilliamsJoe Spano as Francis NurseDirected by Martin Jenkins. Recorded before a live audience at The Culver Stage, Culver City in March of 1994.